3D Scanning Market size was over USD 3 billion in 2016, is predicted to grow at an estimated CAGR of 15% from 2017 to 2024. Technological advancements such as 3D digitization that can offer high resolution and rapid scanning techniques are anticipated to drive the 3D scanning market growth over the future. These advancements are facilitating in reducing risks involved in several areas such as modular design & fabrication methods, and high energy densities. Moreover, rising demand for the technology across numerous industrial sectors such as automotive, aerospace & defense coupled with growing availability to professionals and individuals is expected to contribute towards the industry growth. Increasing affordability of the potential of enhancing Building Information Modeling (BIM) processes with precise on-field data is providing realism on construction sites, thereby boosting the market growth. The advancements and improvements in software are offering several businesses with cost efficient advanced field-scanning technologies. Moreover, the technology is helping Architecture Engineering and Construction (AEC) firms in building an accurate foundation. 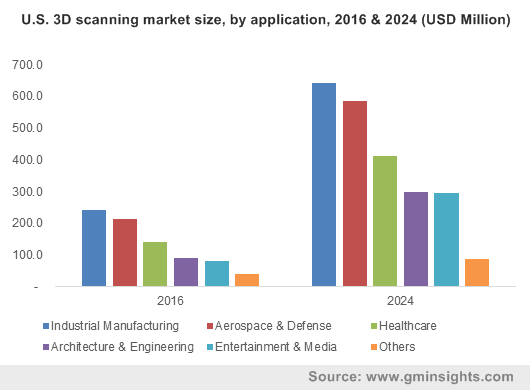 3D laser scanning market is anticipated to witness over 14% CAGR from 2017 to 2024, owing to the high-quality control standards offered by the scanners. The data captured using 3D laser scanning is used by software’s to generate 3D models, which can be applied in several applications such as quality control & inspection, virtual simulation, and reverse engineering. In addition, these scanning techniques are offering real-time visualization and high degree of accuracy. New developments in have given a rise to a growing trend for advanced 3D scan-to-print applications by an extensive range for unaccustomed users thereby driving the industry growth. The short-range 3D scanning market held a significant share of over 40% in 2016. They are widely being used when the distance between the object to be scanned and the scanner is less than one meter. These scanners typically use a structured light or laser triangulation technology. The demand for the short-range scanners is largely driven by applications from automotive and healthcare segments, where high precision is needed at utmost importance. Technological advancements have paved the way for 3D printing growth beyond prototyping. 3D scan-to-print is allowing several industry vendors to manufacture high-quality products and an array of materials such as metals, ceramic and organic materials. Growing demand from the healthcare industry is providing a growth impetus to the 3D scanning market owing to the availability of the advanced features which are helping medical practitioners to accurately measure a patient’s body size, shape, and skin-surface area. Ease of accessibility and low cost is making them appealing for widespread clinical applications. Use of whole-body scanners such as x-ray, CT and MRI scanning in clinical practices have transformed the imaging of the internal body. 3D body surface scanning is projected to become a mainstream medical device of a high value thereby driving the market. As the service and equipment costs of 3D scanning continue to decrease, the opportunity for leveraging the process in the AEC firms will become even more concrete. Many firms have realized the significant value from the technology, which is anticipated to drive the growth. Asia Pacific 3D scanning market is anticipated to witness a CAGR of over 15% during 2017 to 2024. The region has witnessed high penetration of 3D scanners due to the growing adoption rate in infrastructure projects and rising disposable incomes in economies such as China, and India. Technological trends associated with AEC firms will have a high impact on the way building firms design, build, and operate constructions in the coming years, thereby having a profound impact on the demand. Furthermore, the growth of engineering and automobile manufacturing hub has led to an increase in the adoption of the technology. Key players operating in the 3D scanning industry include Ametek, Steinbichler, 3D Systems, 3D Digital Corp., Basis Software Inc, Autodesk Inc., Hexagon AB, Creaform and FARO Technologies, Inc, etc. Due to the existence of several industry players, companies are concentrating on investing in R&D to develop innovative products to help gain industry share and endure the rising competition. The industries are preferring reverse engineering as a service of 3D scanning owing to its effective modification and analysis of industry specific products. 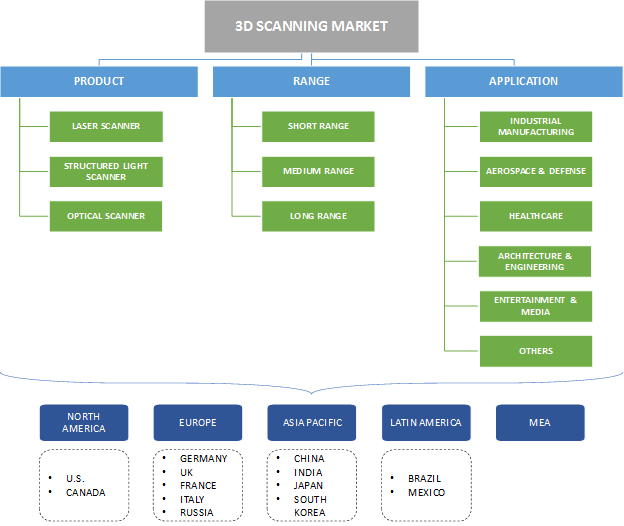 The 3D scanning market is highly fragmented in nature. With the intense competitive atmosphere in the industry, technological advancements undertaken by several industry participants play a vital role in influencing the industry growth. The players are scattered across different applications, technologies, and regions. The technology is being implemented in the entertainment field to generate 3D digital models for movies, photography, and video gaming purposes. They are being used in virtual cinematography as they are quicker to scan objects than manually generating models by using 3D modeling software.